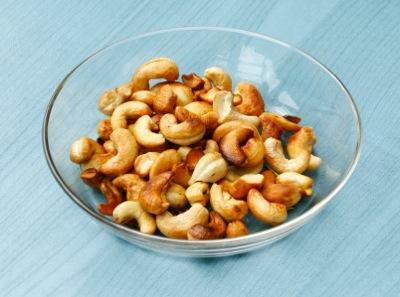 Cashew are a great source of magnesium. If you're looking for magnesium rich foods, you have a wide variety to choose from. Increasing your magnesium intake by adding new foods to your diet is a great way to stay healthy. Magnesium is a very important nutrient when it comes to keeping yourself in optimal health. It's the fourth most abundant mineral in the body and has many important functions, such as maintaining bone health, heart rate, blood clotting, protein formation and producing insulin. It also helps to relax muscles, and often people who experience leg cramps find that a calcium and magnesium supplement helps to ease the problem. Besides aiding in the absorption of nutrients such as calcium and vitamin B, magnesium can also help to prevent cardiovascular disease, glaucoma, osteoporosis, diabetes, depression, asthma and arthritis. Approximately half of your body's magnesium is found in your bones, while the rest if distributed throughout the rest of your tissue and organs. The human body can't store large amounts of magnesium and what you do not use is generally excreted through your urinary and digestive systems. This means that you need to keep up a regular intake of magnesium to make sure that your body has it ready for when it needs it - which is all the time! There are two ways you can get more magnesium: by taking dietary supplements and by eating more magnesium rich foods. While it's easier to take a few pills every day to help increase your intake, it is a lot healthier to get magnesium through your diet since foods usually contain a series of vitamins that work synergistically, meaning that they work together to help your body assimilate nutrients into your system. If you vary the foods you eat to include some of those listed below, you shouldn't need to take an additional supplement. Some really popular foods are already high in magnesium, so you might be getting a good amount already. If you're interested in consuming more, here's a list of foods that will help you increase your intake of this vital nutrient. 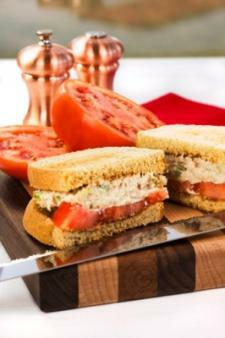 Enjoy a magnesium-rich tuna sandwich. Your magnesium requirements can change depending on your age, gender and what's going on in your life. On the average, it is recommended that adult women get about 310 milligrams of magnesium a day, while adult men need a little more (about 410 milligrams). If you are a pregnant woman, you should be getting about 360 milligrams a day to accommodate the needs of you and your baby. While you can't really overdose on dietary magnesium, you can indeed take too much supplemental magnesium. This means that if you take magnesium pills, you should not take more than the daily recommended amount. A supplemental magnesium overdose can result in abdominal cramping, and over time, kidney failure. If you're looking for more information about increasing your magnesium intake, here are some links that will help you learn more. The National Institute of Health has a great page on magnesium that outlines everything you need to know. Diet.com talks about how much magnesium is a healthy amount and how much it varies by age, stage of life, etc. This is an interesting article about the importance of magnesium and how it can help to resolve lingering health problems.